However, we know we cannot indulge in these tantrums, especially when she has been told she cannot have her way. To keep her from hurting herself, we have created "The Cry Pillow". 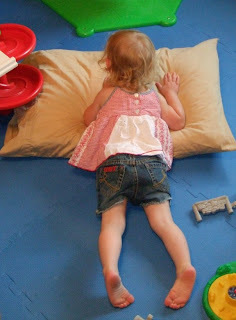 When Alice must run her cry course, we place her on the play mat on her cry pillow and tell her to cry it out on the pillow. We are close at hand, just around the corner, but far enough for her to see that we are not going to cater to her tantrum. She typically crys a few minutes, but then realizes that she is surrounded by toys...and it is much more fun to play with the toys than scream into a pillow. We have run this tactic by our resident child development expert (Jill) and she tells us it is a good method - yay us!